You may have questions while traveling at Orlando International Airport. Everything you’ll need to know is on our website. We’ve gathered the most frequently asked questions below. Click headings to explore. Can I check-in in the parking garage? Yes, airline check-in services are available for passengers flying on Alaska, American, Delta, JetBlue, Southwest and United, on level “R1” of the A and B parking garages and Level 3 of parking garage C. The complimentary service allows passengers to check their luggage (airline baggage fees apply) and receive boarding passes before even entering the terminal, as long as they check-in at least 90 minutes and no more than 4 hours prior to original flight departure time. The “A” Garage location is located on the west end and the “B” Garage location is on the east end (i.e. the ends nearest the entrance ramps). The “C” Garage location is at the entrance to the South APM Station. Children under 18 years of age usually are not required to have a photo ID for domestic flights; however, as each airline has its own requirements, please contact your airline directly to confirm its ID requirement for minors. If you do need to obtain a photo ID for you or your child, they can be obtained from a number of suppliers. The Greater Orlando Aviation Authority recommends arriving three hours before your scheduled departure time, but please check directly with your airline for specific recommendations for your flight. The airport is open 24 hours per day; however, each airline sets its own hours of operation which is dictated by its flight schedule, therefore please contact your airline directly to determine how early you may check-in for a flight. If you require a wheelchair, please contact your airline in advance and they should be able to provide a wheelchair for your use within the airport. 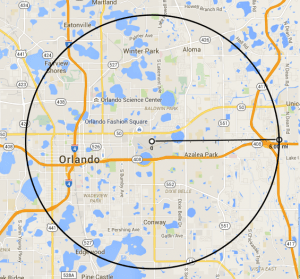 If you require one for the duration of your stay, please email Visit Orlando or visit their web site. They should be able to provide you with a list of companies offering such a service. Skycaps are available to assist passengers. Typical services include curbside check-in, carrying baggage, wheelchair assistance, etc. Please contact your particular airline to arrange for assistance from its skycaps. It is customary to tip skycaps a few dollars for service provided. How far do I have to walk through the airport? Can I go to an Airside Terminal (Gate Area) that I’m not departing from (arriving at)? You will only be allowed through the security checkpoint for the Airside Terminal (Gate Area) that you are departing from. However, due to the configuration of the airport, it is possible to access either Airsides 1 AND 3 (Gates 1-59), OR Airsides 2 AND 4 (Gates 70-129) once you have passed through the security checkpoint for your airside. Similarly on arrival, you may access either Airsides 1 AND 3 (Gates 1-59), OR Airsides 2 AND 4 (Gates 70-129) depending on the Airside on which you arrive, by switching AGTs (trains) in the Main Terminal. If you wish to access the other Airside Terminal which is paired with yours, go directly to the other AGT (train) as soon as you disembark in terminal – do not go past the security checkpoint and out into the Main Terminal otherwise you will NOT be allowed back through security to access the other Airside Terminal. Please note that this may not be possible during certain times of the day for security reasons while international passengers are arriving in the terminal. How do I cross the terminal from Baggage Claim A to Baggage Claim B? Terminal A and Terminal B are opposite sides of the same building, which is only 525 feet across. Crossing from the A-Side to the B-Side (or vice versa) can be done on Level 3 of the terminal building. If you have descended to the Arrivals/Baggage Claim Level (Level 2), you may return to the Departures Level (Level 3) with your baggage to cross to the other side. Does Orlando International Airport have a USO? Yes, the USO Welcome Center is a military-only lounge located in the Main Terminal, A-Side, Level 1. Our center caters to troops and military family members transiting through Orlando, providing a “home away from home” atmosphere where we convey the public’s appreciation for our military. Amenities include business stations with free Internet and e-mail access, TVs, gaming stations, a sleeping room, a children’s room and complimentary food and drinks. USO volunteers are on-hand to assist with travel arrangements and information on local services and to greet service members upon their return from overseas. Hours: 6:00 a.m. to 8:00 p.m. daily. As of July 1, 2003, in accordance with State law, Orlando International Airport became a non-smoking facility. Orlando International Airport has an interfaith chapel inside the main terminal, located just beyond the west security checkpoint (Gates 1-59), which can be accessed by any passenger holding a boarding pass. Catholic mass is held every Sunday at 8:15 am and 12:00 pm. There is also a reflection room located on Airside 4 (Gates 70-99). Wireless internet access (Wi-Fi) is available in all public areas of the airport and is provided free of charge. These Access Points provided by the Greater Orlando Aviation Authority (GOAA) use the WiFi SSID “MCO Internet”. Other access points and peer-to-peer connections which may be listed as available networks are NOT provided by GOAA. Please note that “personal hotspot” devices interfere with the airport’s free Wi-Fi and so if you experience poor performance on the airport “MCO Internet” SSID, please try moving to another location away from other passengers’ active devices, and please help us conserve bandwidth by turning off personal hotspots when not in use. Cellular/PCS wireless is also available from AT&T, Cingular, Sprint, T-Mobile and Verizon. Nextel has declined the opportunity to participate. There are also several kiosks which offer travelers internet connections, in addition to the standard dial service offered by the phone company via the RJ-11 jacks in the pay phones. Orlando International Airport offers many ways to pass the time while waiting for your flight. In addition to the numerous shops, restaurants and bars in the Main Terminal and Airside Terminal buildings (Gate Areas), the hotel atrium between the A-Side and the B-Side of the Main Terminal provides a very pleasant “city park” atmosphere where you can sit and watch the world go by. The terminal top parking garage is also one of the highest points around, and provides excellent views of the airfield, downtown Orlando, and the attractions, including the nightly fireworks displays. On completion of a “Use of Facilities Form”, aircraft spotting/photography is permitted on Level 9 of the Terminal Top Parking Garage (which provides a panoramic view of most of the airfield and airside terminal buildings) and the South Cell Phone Lot. The form must be completed in person, and accompanied by a valid photo I.D., between the hours of 8:00 am and 5:00 pm, Monday to Friday (excluding public holidays), at the Public Affairs office, located on the 3rd level of the Main Terminal, Aide A, in the Aviation Authority Executive Offices (to the left of the East Security Checkpoint for Gates 70-129). Yes. Bicycle racks are provided on the A-Side of the Terminal, at the east end of the Ground Transportation Level (Level 1). Please see the Parking page of our web site for a list of the parking options at Orlando International Airport. Which hotel is closest to the airport? The Hyatt Regency Orlando International Airport is located inside the East Hall, between the A-Side and the B-Side of the Terminal, at Orlando International Airport. Which hotels offer free transportation to/from the airport? Please see Local Hotels for a list of hotels offering free airport shuttles. On which side of the terminal (A or B) do I pick up/drop off passengers? To determine on which side (A or B) of the Terminal your airline operates, please visit the Airlines page of our web site. Private vehicles may drop domestic passengers off at the curbside check-in on the Departures Level (Level 3) on either the A-Side or B-Side of the Terminal. If you wish to park after dropping off passengers and luggage, follow signs to either Economy Parking or use the “Quick Park” ramp (located on the left, at the end of the Departures Curb) to access the Terminal Garage Parking. Although dropping off passengers on the curb outside the Terminal is still permitted, vehicles may not be stationary unless actively unloading passengers and/or baggage, and under no circumstances may vehicles be left unattended. Picking up passengers at the Arrivals/Baggage Claim Curb (Level 2) outside the A-Side or B-Side of the Terminal is permitted; however, vehicles may not be stationary unless actively loading passengers and/or baggage, and under no circumstances may vehicles be left unattended. Therefore please use the FREE! Cell Phone Lot and allow at least 20 minutes after aircraft arrival time (30 minutes if passenger has checked baggage) to allow for passengers to transfer to the Main Terminal, and exit the baggage claim area. To determine on which side of the Terminal (A or B) your airline operates, please visit the Airlines page of our web site. Can I meet passengers at the gate? Although only ticketed passengers are allowed through security and out to the airside terminals (gate areas), it is possible to have gate passes issued to non-travelers under certain circumstances. These are issued at the airline’s discretion, so please go to your airline’s ticket counter, provide a valid photo ID, and the airline will determine whether they are able to issue you a pass based on your particular circumstances. Where is the best place to meet passengers arriving in Orlando? Please see the Airport Terminal page or the Arrivals Guide on our web site to find these locations. How can I find out if a flight has arrived? Please use our live flight information display, call 407-825-TIME (8463) or contact the airline directly to determine whether a specific flight has arrived. The customer signs a waiver of liability while the staff tag their bags, and gives the customer a claim ticket. The customer is then free to roam about the city luggage-free. To retrieve luggage the customer can return to the desk on Level 1 of the B-Side, or have Hold My Luggage meet the customer at their airline check-in location. They can be contacted at 321-888-0242. Can I get my luggage wrapped? Wrap N’ Fly operates on Level 1 on the A-Side of the Main Terminal, near the USO, from 6:00am-8:00pm. They can be contacted at 407-825-1529. Can I take my hoverboard with me? Hoverboards should not be placed in checked or carry-on baggage as most airlines have banned their carriage; however, they may be shipped by FedEx, UPS, etc. Please contact your airline directly regarding your missing item(s) as directed on your ticket or baggage receipt. Claims for missing items may also be filed with theTransportation Security Administration (TSA), which is responsible for the screening of passengers and baggage at all U.S. airports. You may also file a report with the Orlando Police Department, which has jurisdiction over thefts which occur at the Orlando International Airport. This may be done by calling the Orlando Police Department Information Desk, which is available 24 hours per day, at (407) 246-2470. Please see the TSA “Can I Bring” web site for details of permitted and prohibited items. Can I bring alcohol (including homemade wine) into the U.S.? Can I bring animal products/foodstuffs into the U.S.? Can I bring baby formula into the U.S.? According to the US Department of Agriculture, the majority of milk products originating from countries affected with Foot and Mouth Diseases are prohibited; however, Plant Protection and Quarantine has been instructed to provide some exceptions including “Milk and milk products intended for use by infants or very young children are enterable (into the U.S.) if in a reasonable or small quantity for several days’ use”. For more information on this topic please visit the Importations of Milk and Other Diary Products in the USDA Animal Product Manual. Can I get my sales tax refunded at the airport? According to the U.S. Customs and Border Protection web site (www.cbp.gov), foreign visitors to the United States frequently confuse the state sales tax with value-added tax (VAT). The state sales tax is a small tax on purchases or services, calculated at the time of purchase, which the individual states assess and which the U.S. federal government neither determines nor receives. VAT, on the other hand, is a national tax commonly applied in foreign countries that is included in the actual sales price of an item. The United States does not have a VAT, and the federal government cannot refund state sales taxes. Some states do not charge tax on items shipped out of state, therefore please ask about sales-tax policies in the state where you make your purchases. Where do I go to pick up a pet shipped as cargo? Pets which are shipped rather than carried on-board the aircraft by a passenger are generally handled through the cargo facility for the airline, not in the passenger terminal, so please contact your airline or cargo handling company directly for details of where to drop-off/pick up your pet. Who do I contact to ship a pet as cargo? There are many companies that do this, including the airlines and cargo handling companies listed on our website, as well as AirAnimal, a company specializing in transporting pets. What requirements are there for traveling with/transporting a pet? Before traveling with a pet you should review the APHIS web site. If you are importing pets from another state, please review the Florida Department of Agriculture and Consumer Services web site. Where can I walk my dog while at the airport? Dogs are not permitted in Orlando International Airport unless they are either working dogs, or they are in a carrier approved for traveling onboard an aircraft. 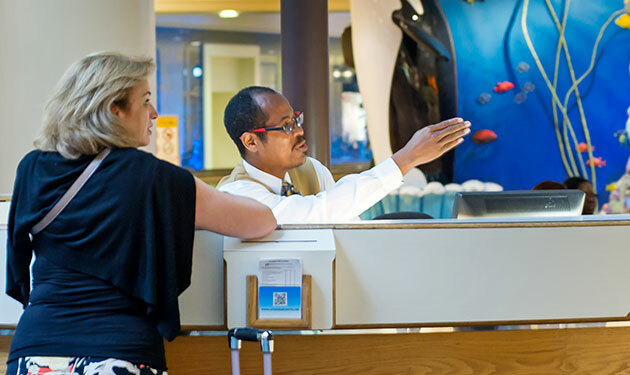 Service Animal Relief Areas are available on Level 2 of both terminals. The “A” side area is located at the far East end of the building (to the right as you exit the building). The “B” side area is located at the far West end of the building (to the right as you exit the building). Per FAA regulations, nobody may operate a UAS / drones of any type within 5 miles of an airport without first contacting the airport or the air traffic control tower. GOAA is working with the FAA and the industry to better serve all affected by these regulations. Please review the maps and links below before operating a UAS / drone. 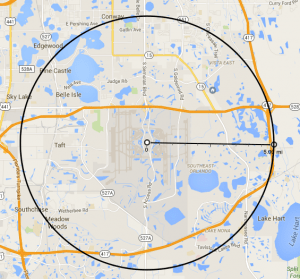 How did the airport get the designator “MCO”? The airport designator code “MCO” comes from the former McCoy Air Force Base, named after Colonel Michael N. W. McCoy, on which site, located at -81.08W 28.96 N, and at 113 feet (34 meters) above sea level, Orlando International Airport now stands. How do I charter an aircraft/helicopter? The quickest way to get quotes for your charter is either call an aircraft charter company directly or call a broker that deals with charters. Any number of them will show up on an internet search for “Aircraft Charter.” The beauty of aircraft charter is that the company does not need to be based at your departure airport because the aircraft are constantly in use and widely distributed. Can I get a temporary disabled parking permit while in Orlando? Where can I rent a cellular/mobile phone? Please contact Visit Orlando who should be able to provide you with a list of local companies offering such a service. How do I find out about job opportunities at the airport? Applications must be completed online, but must be submitted for specific job opportunities which are currently open, as stated in the Application Procedure, which can be found on the web site, along with our current job postings. The Greater Orlando Aviation Authority only recruits for the Aviation Authority, employment opportunities with the other organizations at Orlando International Airport, such as airlines, cleaners, concessions, parking, etc. are handled by each separate organization that must be contacted directly (see the Employment Guide for more details). Which is the closest airport to Orlando? Disney World? Orlando Executive Airport (ORL) is located near downtown Orlando, but is a general aviation airport and is not served by commercial airlines. Orlando Sanford Airport (SFB) is 33 miles from Orlando International Airport, and 60 miles from Disney World, along toll road SR 417 which takes you right past…… Orlando International Airport! Orlando International Airport (MCO) the airport that lands you closest to your final destination, wherever that happens to be in Orlando. Please visit the Contact page of our web site.